The Gosei Maru was launched in August 1937 from the Tsurumi Seitetsu Zosen KK (Tsurumi Iron Works Dockyard) at Yokohama for Koun Kisen K. K. Although owned by this company, the new ship was managed by Yamashita Kisen Kaisha. She was a coastal freighter of 1,931 tons gross, 82.3 metres (271.6 feet) long and 12.2 metres (40.0 feet) wide. 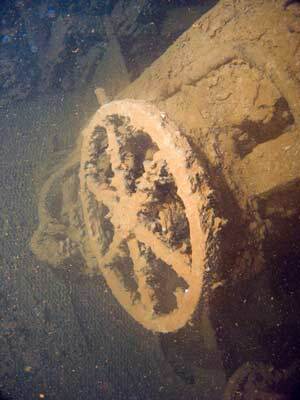 Powered by a Tsurumi built coal powered reciprocal steam engine, the Gosei Maru was not a particularly large ship. I am unsure of her early life, but it could be assumed that she was used for a few years to transport cargo and/or passengers around Japan and the Pacific. Once the war started, or perhaps even before, the ship was taken over by the Imperial Japanese Navy and used as a support ship for Japanese submarines. She was based with the Sixth Fleet. and was used to transport supplies for the submarines, things like torpedoes, depth charges and spare parts. On the morning of 17 February 1944, the Gosei Maru was lying at anchor on the north-eastern side of Uman Island in Chuuk Lagoon. The Lagoon had already been attacked by hundreds of American planes over the previous 24 hours as Operation Hailstone was unleashed on the Japanese fleet anchored in the lagoon. 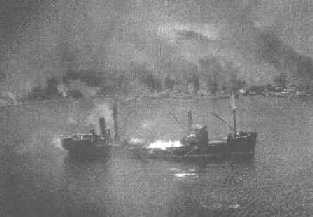 On 17 February, she was attacked by dive bombers. The photo below appears to show the Gosei under attack, perhaps a bomb exploding on the port side amidships. The ship faced into the easterly wind when at about 0918 hours aircraft of USS Monterey and USS Bunker Hill (Strike 3C) attacked the helpless ship. A torpedo bomber from the Monterey attacked the Gosei Maru (after two unsuccessful attempts by other planes) and scored a direct hit on the starboard side near hold one. Today the Gosei Maru is located at a GPS Reading of N7° 18' 40.3" E151° 53' 14.6" using WGS84 as the datum. This will put you on the stern which is only only 2.5 metres deep. 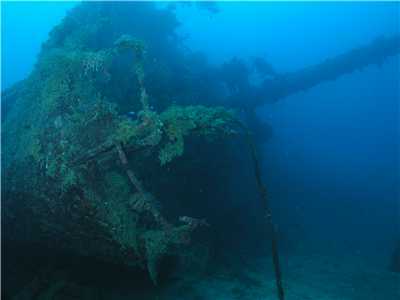 She lies on a steep incline with the maximum depth of about 35 metres being under the bow (which is 31 metres). She has a very pronounced list and is almost totally over on her port side. 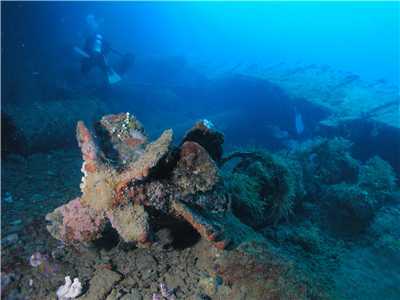 As such, it is a very easy wreck to find as it can easily be seen from the surface. 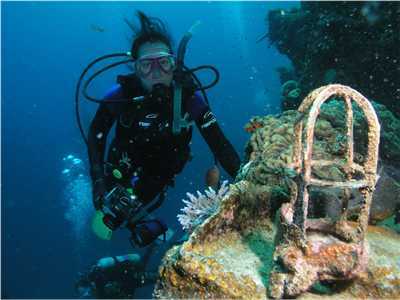 Dive boats normally anchor at the stern. 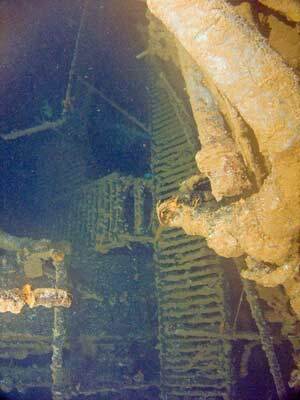 As you descend to the wreck the first thing you will see is the prop. It is four bladed and very much photographed due to its shallow depth. Rather than look at it now, head straight to the bow area along the railing of the starboard side. As you go you will see a large ripple in the hull about half way along the wreck. 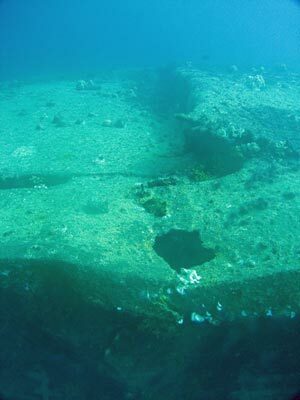 Just past the ripple, if the visibility is not too bad, you will see the torpedo hole that caused the sinking of the Gosei Maru. The torpedo hole is adjacent to Hold 1 and this is the easiest way to enter this hold. As soon as you see it, head across the hull and drop into the hole. 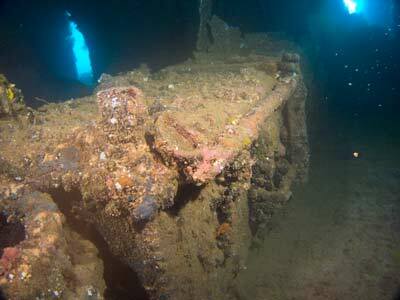 The torpedo hole is very large, with the hull plates bent in dramatically from the explosion. Swim in through the torpedo hole and out the front of the hold and go to the bow. 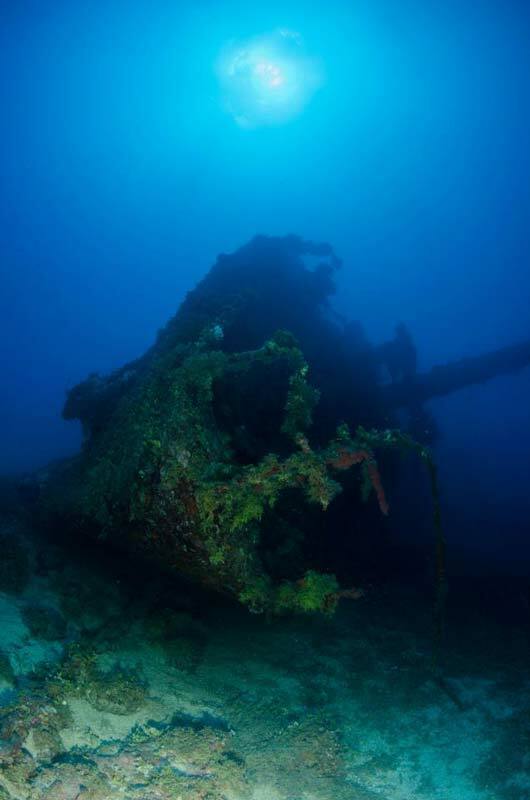 If you are a photographer, I especially recommend going a little off the wreck to look back. You can get a very good photo, with the mast hanging out over the sand. From here, head back to Hold 1. This hold appears to be mostly empty, but there are many 44 gallon (200 litre) drums and some artillery shells. There are also some rifle rounds and coal in this hold. As mentioned, the hull aft of the torpedo hole is extensively damaged, with a large ripple (wave is probably more accurate) running from the deck to the bottom of the hull. Behind Hold 1 is the bridge (situated forward rather than in the middle of the ship). When I first dived this wreck back in 1997, this could be explored easily and there were many toilets, baths and other things to be seen. However, it has now collapsed and it would be quite difficult to enter. Hold 2 is straight behind the bridge area. 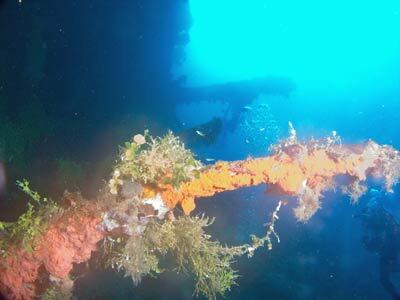 This is the most interesting part of the wreck. It contains dozens of torpedoes. There are at least 14 that are visible. 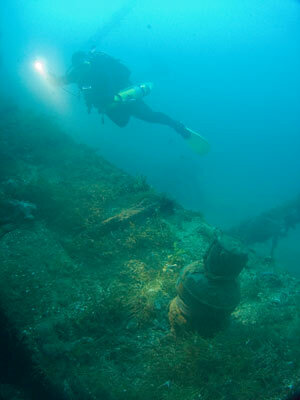 The torpedoes are located all over the port side of the wreck (the bottom as you look at it) and are in two or three parts. Some of the torpedoes have exploded (more about this later) but others are still intact. There are the body sections, warheads and engines. They are everywhere, scattered up and down, lying port and starboard. Look carefully and you will see at least one of each of the parts. The torpedoes have contra rotating props, that is, two propellers that run in opposite directions, thus making the torpedo run far straighter than a single prop torpedo. 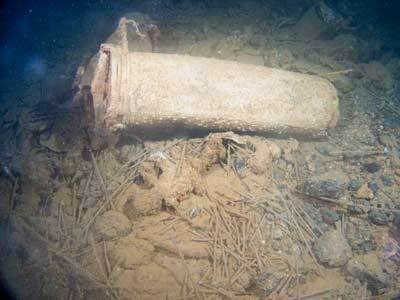 You will also see oxygen cylinders (round cylinders) which provided the propulsion for the torpedo. Some of the torpedoes exploded in the early 1970s, not from the warheads exploding, but by the compressed oxygencylinders inside the bodies exploding. In 1976 it was decided to explode the remaining bodies for safety reasons. Despite this, the hold is still very interesting. It also contains other items, including bottles and loads of what appears to be gravel. Hold 3 is straight behind Hold 2 and is connected. It is empty as far as I remember except for some more gravel (which also extends outside both holds). Behind here is the kingpost (I think) and there is what looks like a very small hold here. However, I am pretty sure that this is in fact the coal bunker. You can swim into the engine room from Hold 3 and the coal bunker via a door. There are other access points via the funnel and skylights. The engine room is quite compact and very dark but you can still explore around and under the engine itself. It is a triple expansion steam engine. However, if you are wearing twin tanks it is a lot harder, if not impossible, to get to some spots. The boiler firebox door is open and you can see how the coal would have been shovelled into the firebox from the coal bunker. There are also many steam pipes and valves as well as large wheels for huge valves. In the engine room, up high and at the rear on the starboard wall, there are some interesting items. Here there are two rows of tools. 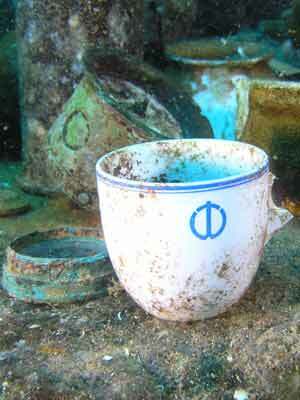 These were for the engine room and are similar to those found on the wreck of the SS Tuggerah in Sydney. As mentioned above, you can enter/exit via the skylights. This brings you out near the stern. 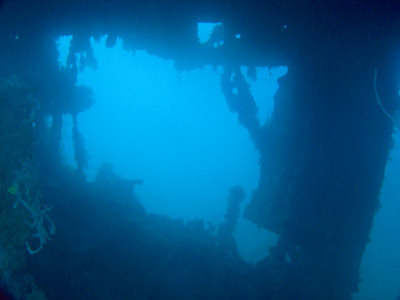 The stern (for this is where the engine is located), has many levels to be explored, all open as the timber decking and some of the upper hull has disappeared, either eaten or rusted away depending on the material. There are toilets, baths and urinals within. As you exit the compartments, you can see the almost fully intact funnel still in place. The stern of the ship has some interesting artefacts on it and you can get some really good photographs of these items. Last but not least, now you can take time to examine the large four bladed prop. 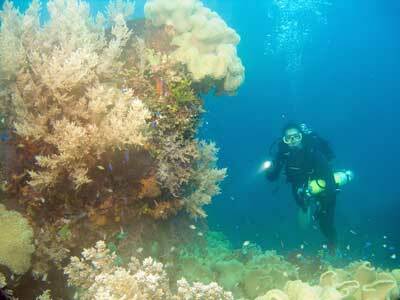 If you are a photographer, spend the rest of the dive taking photographs of the prop from under, behind and above. You may even get a prize winning shot. 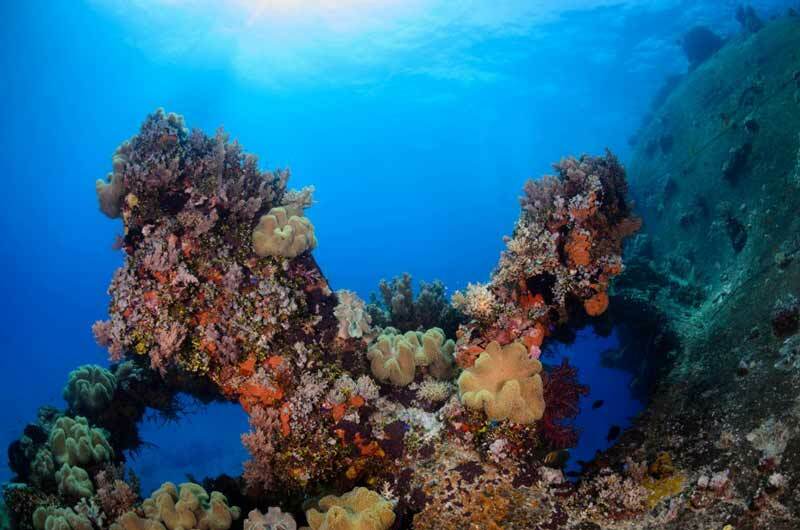 While this is one of the smallest wrecks in Chuuk Lagoon, it is still worth diving. Usually done as a second dive, although you may do it as a first dive. The visibility here is not too bad, getting up to 30 metres at time, but more likely 15 to 20 metres. 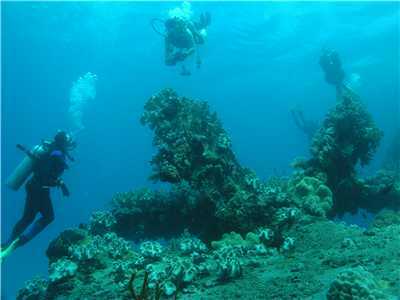 Like all Chuuk Lagoon wrecks, the water temperature is about 28 to 30 degrees Celsius. 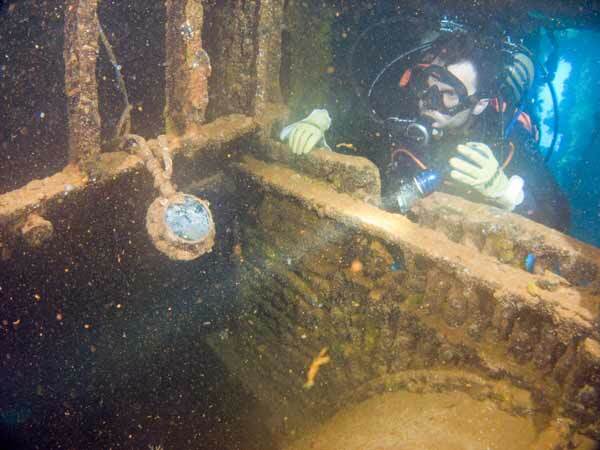 This wreck is well worth doing. 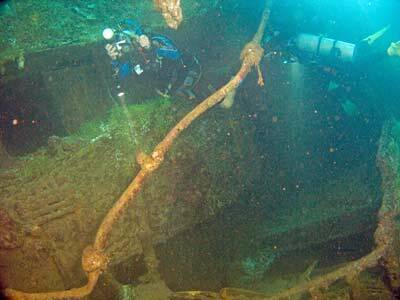 Another great Chuuk wreck.